First, our SVG V grooving machine is vertical type V cutting machine, with CNC 2-axis control. At beginning, we designed machine according requirements of decoration industry. After V cutting, the sheet metal bending radius shall be smaller. Such required products includes show case, show room, and elevator’s sheet metal. The machine is suitable for thin mild steel, stainless steel plate and other material metal sheet. X – axis, V grooving length; complete width of plate; X-axis is with AC SEW frequency gear motor. We shall not cut half or non-complete width of plate. make sure that the cutters will remove the metal scrap continually. and The metal will not break self. The SVG V GROOVING machine use driving element of the precision ball screw, which has high machining precision and is particularly important to the high-end products. Such structures are same to foreign equipment. The machine controller is with two axes, Y-axis (back gauge to feed sheet and positioning horizontally), Z-axis (V cutter vertical position) servo control. SEW gear motor drive X-axis. After parameter input, machine can run automatically. The cutter frame transmission screw adopts multi head thread structure and guide system with high precision machining. so that the power transmission is stable and reliable. The tool slide way is cast iron material, wear-resistant and repairable. Normally the service life is guaranteed for more than ten years. The plate clamping system is with pneumatic, including holding feet along X-axis and back gauge clamps. so the holding force is enough and stable. The noise is obviously lower. CNC controller program design is reasonable and easy to master. As long as operator input processing parameters, the equipment will automatically run and process. And there are a number of chain security measures to ensure the safe operation of the equipment. We used world or domestic famous brand parts , such as CNC screen, PLC, servo motor, motor reducer, linear guide, ball screw rod and other important parts. We tempered all main structure parts to eliminate residual stress treatment. so that the equipment can guarantee the long-term processing precision. Germany brand SEW AC gear motor is with high cutting force for X axis. Z axis with Delta servo motor. Cutter frame is cast steel, stable and Wear resistance. Full V Grooving length is with pneumatic holding press. So that It will guarantee V cutting position accuracy and V depth accuracy. it is good both for thin and thicker plate V cutting. for metal sheet like AL, because the metal sheet is soft, during cutting, the scrape metal will stick on the cutter. and We shall apply spray cooling to avoid this problem happen. while for high speed V groove cutting, cooling also can prevent cutter. SVG model v grooving machine can install max 6 pcs cutters. High speed steel cutter is suitable for various material and different V angle cutting. cutter can be ground to reuse. 3 pcs alloy cutter is suitable for stainless steel plate V cutting. Each cutter has 8 cutting edges. 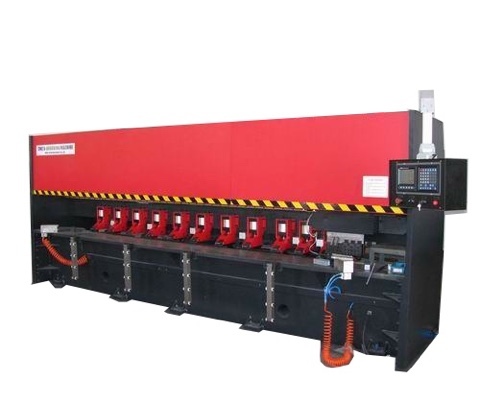 How to Calculate Hydraulic Press Brake Bending Force?